Sandstorm's Blog (Home of ssUltimate Library): Choosing the Fastest Internet Connection Setting near you! Choosing the Fastest Internet Connection Setting near you! Normally your Internet Service Provider (ISP) controls the settings you can use to connect to internet. They also have their own Domain Name System (DNS). But accidentally I found out that while that is the normal way, we can still improve its speed. And the trick lies in not relying blindly onto the DNS used and provided by our ISP. It simply says that because we as humans remember names better than number combinations, then DNS is responsible in translating for instance sandstorm36.blogspot.com into its corresponding IP Address. Imagine if we don't have DNS, then instead of saying "google it", you would end up saying "74.125.237.116 it!". LOL! 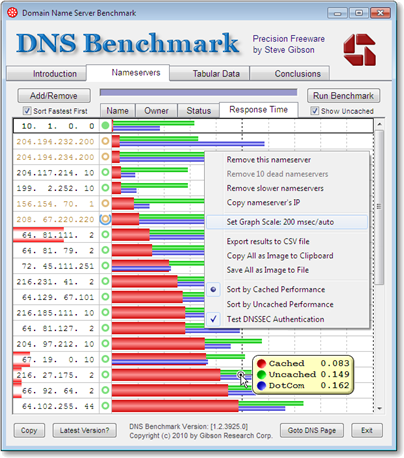 So how does choosing the best DNS affects our browsing speed? Well the better and more complete the phone book is, the better result we can get. And since our internet response is really very slow here in Papua New Guinea, that I really needed to do a constant refreshing/reloading of the webpage just so I can browse it, I decided to look for an alternative DNS, the one that is likewise best nearest to this City and Country. And the best tool (the one I know so far) is GRC's Domain Name Server Benchmark Tool provided to us by Steve Gibson. The size of that tool is very small and what it will do is perform a benchmark test of the available DNS and tells you which of those are best for your need based on your location. Here is a sample image of that tool in action. The first benchmark I ran on my end shows our ISP's DNS to be 4th in the ranking. Number one is of course our server's domain followed by Google's Public DNS of 8.8.4.4. and on the 3rd slot its 8.8.8.8. Second run moves our ISP's DNS down to the 6th place while Google's retain its top positions. Third and fourth run show's our ISP to be on the 2nd beating Google's Public DNS. But since I have been using our ISP's DNS and never got a satisfactory result, I tried using Google's 8.8.4.4 and my oh my, I am impressed with the renewed vigor of browsing speed. While sometimes I still need to reload the webpage, its occurrence is now comparably minimal. However, just to make sure I will get the best of both worlds, I put all three DNS making 8.8.4.4 as the preferred followed by 8.8.8.8 and last our ISP's. That is just an added precaution that should the preferred DNS fails, I have the other two as fallback. Anyway, the purpose of this blog is to let you know how to check for alternative DNS and on how to choose wisely via the DNS Benchamarking tool plus performing your own tests. And for this to work, you have to make your DNS configuration Static. I hope that switching to Google's Public DNS or any of the top DNS that will be shown on the benchmark result may prove to be faster on your end as in mine. Well, it is really nice to choose the right and fastest internet connection. You can work easily using fast internet and enjoy surfing through the web. Having a stable and affordable internet provider that will sustain your needs for browsing and researching is a great investment you need to make in the growing internet age.